Haley Cassell, 16, laughs with her sister, Olivia, 8 (center), and her grandmother Anita (right) as Haley's mother, Amy, performs in A Center Point Holiday at the facility in north Tulsa. The holiday play was written, organized and performed by the 33 women in the program for their families and friends. Center Point in Tulsa provides therapeutic recovery for incarcerated women with drug and alcohol addictions. Amy Cassell hugs her daughter, Haley, 16, following the performance of A Center Point Holiday at the facility in north Tulsa. The holiday play was written, organized and performed by the 33 women in the program for their families and friends. Center Point in Tulsa provides therapeutic recovery for incarcerated women with drug and alcohol addictions. Amy Cassell (left) and Medea Glass perform in A Center Point Holiday at the residential rehabilitation facility in north Tulsa. Many of the residents are serving the final portion of substance-abuse sentences. 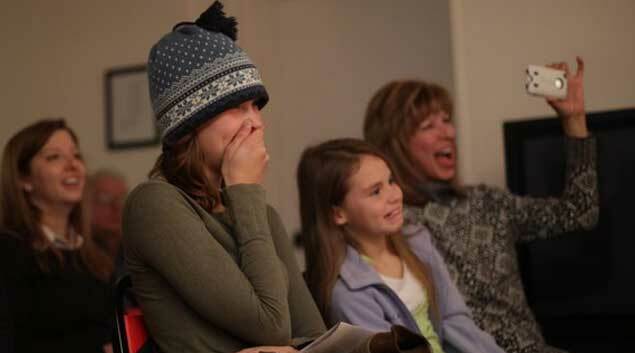 Haley Cassell, 16, laughs with her sister, Olivia, 8 (center), and her grandmother Anita (right) as Haley’s mother, Amy, performs in A Center Point Holiday at the facility in north Tulsa. The holiday play was written, organized and performed by the 33 women in the program for their families and friends. Center Point in Tulsa provides therapeutic recovery for incarcerated women with drug and alcohol addictions. Traditionally, Christmas plays focus on some sort of redemption story, inspired by the magic of the holidays. The women who live at Center Point, near 36th Street North and Lewis Avenue, are struggling with substance abuse, most of them serving the final portion of drug-related sentences for the Oklahoma Department of Corrections. Their holiday play, for an audience of roommates, staff members and family, focuses on messages of recovery, sobriety and sisterhood. Grandmas and husbands bring presents to place under the home’s Christmas tree. Many of the women here are mothers, and this may be their first chance since entering prison to spend part of Christmas with their kids. Children are allowed to stay for overnight visits with their mothers at Center Point. “Believe it or not, I have some actresses here,” program director Regina Price says at the introduction. A sheet with tinsel stapled to it stands in for the stage curtain. Two women read some history about holiday traditions: Christmas, Hanukkah, Kwanzaa. Lacey James takes the stage for a skit about a woman named Fancy who becomes sad because of haunting memories from the past. Hailee Bullock and Debra Hassinger act out scenes from the Reba McEntire hit “Fancy,” while Lacey sings: “Here’s your one chance Fancy, don’t let me down.” In the skit, Fancy realizes she’s depressed about her tough past, so she calls her friends. They come over and cheer her up. It’s a lesson the women have learned at Center Point: Lean on your friends and loved ones in tough times, not drugs or alcohol. There’s a reading of “Twas the Night Before Christmas” for the children in the audience, and then a little humor from Amy Cassell and Medea Glass: “Grandma Got Run Over by a Reindeer,” complete with forehead hoofprints and Beyonce dance moves. Cassell’s mother, Anita Miller, dabs tears at the corner of her eyes while recording it with her iPhone. She’s caring for Cassell’s three daughters while Cassell serves time for felony DUI charges. Cassell chose to come to Center Point, even though it added time onto her sentence. She wants to get sober, but Miller says she knows the road Cassell faces after her release will be tough. They have a moment of silence for addicts and their families who are still suffering. Then they sing “Silent Night,” all three verses. The play is over, and Cassell’s three daughters rush to hug her. Radiantly beaming, with the promise of redeeming grace.